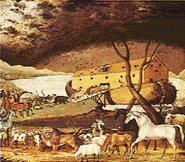 Have you ever considered that Lent and the story of Noah and the Ark are full of rich, powerful and similar imagery? They are both events of 40 days and have been linked by the Church for many years. We as humans experience them as forty storm tossed days, not knowing where they will lead, images of death, destruction, yet in the end New Life and a re-Creation where all things are made new. A new World after the Flood, and in the Resurrection a new Kingdom. God of the covenant, as the forty days of deluge swept away the world’s corruption and watered new beginnings of righteousness and life, so in the saving flood of baptism Your people are washed clean and born again. Throughout these Forty days, we beg You, unseal for us the wellspring of Your grace, cleanse our hearts of all that is not holy, and cause Your gift of new life to flourish once again. Grant this through Jesus Christ, our Liberator from sin, Who lives and reigns with You in the unity of the Holy Spirit, Holy and Mighty God for ever and ever. I ran accross this on the web, and thought it was a great idea to focus on, especially during Lent. Go look at the original post at Preacher Mike's and be sure to read the comments! 1. The people working at the airport didn’t make the flights late. They didn’t create the bad weather or the mechanical problems. 2. The umpires and refs aren’t wanting the other team to win. They sometimes make bad calls, but it isn’t because they don’t like your team. 3. The person needing to merge isn’t testing your manhood (or womanhood). It’s all right to let them in. 4. Your child isn’t completely objective about his/her coaches and teachers. 5. People who disagree with you politically are probably still pretty good people, all things considered. 6. The person serving you at the restaurant is probably overworked and underpaid. What a great place to be extravagant with your expression of thanks. 7. Brothers and sisters at church who disagree with you have stories behind their feelings — some of which are hidden so deep they don’t even know them (just as you have such stories). This is such a powerful way to remember our Baptism, where we vowed to "seek and serve Christ in all persons, loving our neighbor as ourselves". Today the Church remembers Matthias. Matthias is a Hellenized version of the Jewish name Mattithiah, which means "gift of Yahweh." After the Ascension of Our Lord, His followers left Galilee, and returned to Jerusalem. There they decided they needed to choose a replacement to fill the place of Judas in the Apostolate. Two disciples, who had been with Jesus from His baptism by John to the Ascension, were chosen, namely Joseph, called Barsabas, and Matthias. Both men appeared equally good to the assembled Apostles, so, as was sometimes done, when each candidate was of equally approved merit, lots where cast to determine God's choice. Now that is something that seems reckless to me, but perhaps the Apostles depended on God more than I do! The lots were cast and fell to Matthias, and as the Scriptures say, he was numbered with the Apostles. After the first chapter of Acts, nothing certain is known of his life, however there is a tradition that he first preached the Gospel in Judea, then went on to Ethiopia where he preached among cannibals and eventually lost his life. He must have undergone great hardships and labors in the middle of such a dangerous place. Can you imagine how foreign that place would seemed to a first century Jew? How scary it must have been? 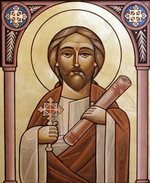 We also find in the traditions of the Church that Judas's misfortune filled St. Matthias with great humility, being concerned that he also might fall. He considered his calling to be purely of God and not of himself, especially concerning the way he was elected and numbered among the Apostles. Clement of Alexandria records one quote reputed to be from him in a sentence that the Nicolaitans ascribe to Matthias: "we must combat our flesh, set no value upon it, and concede to it nothing that can flatter it, but rather increase the growth of our soul by faith and knowledge". 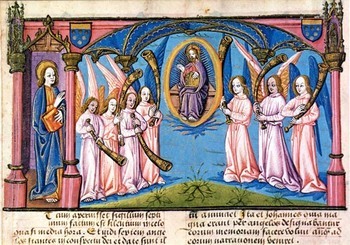 O Almighty God, Who in the place of Judas chose Your faithful servant Matthias to be numbered among the Twelve: Grant that Your Church, being delivered from false apostles, may always be ordered and guided by faithful and true pastors; through Jesus Christ our Lord, Who lives and reigns with You, in the unity of the Holy Spirit, one God, now and for ever. Here we are two days into Lent. I am just getting back to work after a pretty severe cold (sure felt like the flu!). It was the first time in decades that I was not at Mass for Ash Wednesday, however in my Parish, if you can't make it, they will come to you. I invite you, therefore, in the name of the Church, to the observance of a holy Lent, by self examination and repentance; by prayer, fasting, and self denial; and by reading and meditating on God’s holy Word. Why do I do this? Why did I want the Church to come to my home and impose ashes? Couldn't I just have skipped it? Well yes, I could have, but you know there are meanings to the physical things we do. So then, here it is, and even illness did not keep me from the physical act of worship the larger question remains. "How will I follow Jesus, as He spends forty days in the wilderness"? I haven't been able to focus my mind this week, but my daily Rosary for my "Seven Angels", weekly attendance at Mass, Prayer and acts for returning soldiers, and a surprise gift of a book from a co-worker will be the basis of my journey this Lent. Therefore before my Parish community and this blog community, I commit to the observance of a holy Lent. And once again, the flow of the Church Year continues - from Ashes to Easter, from death to Life. The ashes in my living room are to me a sign of my mortality and (hopefully) penitence, but they are also a reminder that only by His gracious Gift that everlasting Life is promised anew; through Jesus Christ our Savior. Amen. Today is the day before Ash Wednesday, and I want to point out that it is also called "Shrove Tuesday". This is the final day of Carnival, the Fast of Lent beginning on Ash Wednesday. For many centuries people went to confession and were "shriven" of their sins, and then gathered all the fat (oil) in the house to use before the Fast of Lent descended. Thus began the party atmosphere and the tradition of pancakes, using the oil. They had no oil in their foods for the next 40 days. I was talking to a friend at my Parish this Sunday, and she pointed out that Lent was one season that modern commercialism has not totally debased. How would the multi-colored Sunday Advertisements be centered around the theme of penitence and contrition and self-examination in the light of Christ. I don't think that would be very easy, so we, as humans focus only on the wild parties of Mardi Gras, forgetting this is also a day of Confession and preparation. Our modern life isn't interrupted by the Sacred enough, today enjoy the parties and pancakes but remember the Sacred, remember that under the Mardi Gras mask, we still need an examined life. As Lent approaches, I want to share one of the things I am going to be doing this year. I will be saying an intentional Rosary for seven Pastors/Teachers that are part of my community. Each of them will be contacted and know that will be going on. I will do one each day for one person cycling through the week through out the forty days of Lent. I am also going to do a daily prayer for the soldiers who have returned from the war in Iraq. Once a week I will conduct Evening Prayer at my parish, and attend Stations of the Cross on Fridays. Anyone else care to share what they may be doing? Long ago, there was a man called Valentine, who through his devotion to the idea of love and the Sacrament of Marriage, taught us a great deal about the relationship between Christ and His Church. He seems to have been buried on the Flaminian Way; and about 350 a church was built over this tomb, and later a catacomb was constructed underneath, containing the remains of many Martyrs. This church, with its cemetery, was the first to greet the eyes of pilgrims coming to Rome to visit the tombs of the ancient heroes of the Faith, and therefore St. Valentine's fame grew, and spread through the world. The Emperor of the time, named Claudius was having problems recruiting men to serve in his armies, because the men selfishly wanted to stay home with their wives and children. Angry that his men were more loyal to their wives than to himself, Claudius decided to greatly restrict marriage! Couples who were in love searched for someone who would help them get married, even in secret. Valentine was a priest who would perform wedding ceremonies for these desperate young lovers. When a young couple came to him, he secretly united them in marriage in front of God's sacred altar. Father Valentine quickly became the friend of lovers in every district of Rome. When Claudius heard what Valentine was doing he ordered him thrown into jail. It appears that Valentine was dragged from the altar where a young couple stood, ready to be married, and taken off to jail. One of the main traditions that surround Valentine is the one concerning his jailer's daughter, Augustine. She was so kind to Valentine during his brutal imprisonment, that Valentine sent a ‘Valentine’s Card’ (a short note) with a grateful "thank you” message for all that she had done. Many asked the Emperor Claudius to release Valentine but Claudius refused to do so. As a punishment for supporting marriage, Valentine was beaten to death with clubs and then beheaded. Valentine laid down his life for others because he passionately believed in the sanctity of love and marriage. His devoted friends buried him on the Flaminian Way. The date of his tragic murder was February 14th AD 270. For this reason the day has been looked upon as specially consecrated to lovers and as the occasion for writing love letters and sending cards. Almighty and everlasting God, who kindled the flame of Your Love in the heart of Your holy martyr Valentine: Grant to us, Your humble servants, a like faith and power of love, that we who rejoice in his triumph may profit by his example; through Jesus Christ our Lord, Who lives and reigns with You and the Holy Spirit, one God, for ever and ever. Amen. Infallible Bible or flawed understanding? question the infallibility of the Bible in my postings because I never see that as the point. What I do question, is people's interpretation of the Scriptures. Let me ask some questions. Has the Church changed in the last two thousand years? Has the Bible (our infallible Bible) changed, or have we? Between 1842-1846, when anesthesia was "invented" and available, a great controversy erupted. The issue was whether or not it was "morally right" to give it to women during childbirth. The dilemma was that if it were given to women, it would violate God's precept that women must deliver their children in sorrow and pain as a punishment for having brought sin into the world. This was a position intensely fought, and the Archbishop of Canterbury confronted Queen Victoria herself on the matter. She pointed out that Genesis told us to eat bread by the "sweat of our brow" and His Grace, the Archbishop did not look like he was doing much work to get as plump as he did. Now these days I know of NO ONE that truly advocates the position that women should continue to suffer in childbirth as a result of the sin of Eve, yet... has the Bible changed or has our interpretation of it? There are other examples, such as thinking the sun revolved around the earth, or legal slavery. Again, has the Bible changed? No.. has man's understanding changed? Yes. There is a lot of turmoil in the Church these days coming from a changing understanding of what it means to be a homosexual. The Scriptures are used to bludgeon gays and lesbians in ways that damages the traditional understanding of contextual readings. I believe that if you read the "clobber verses" in context, you will find that the core sin is idolatry, not the methods used to perform it. In past times the Church actually persecuted people who were left handed, and if you weren’t careful you would end up being burned as a witch (that is if you did not have good connections in the community). Now my own daughter is left handed. It makes me shudder when I think of what could have been done to her if she had been born in another time. Those of us Christians who scream and yell about homosexual persons need to remember that what we know as romantic heterosexual marriage is only about 200 years old, and has very little basis in Biblical traditions, those marriages were arranged and mostly polygamous. All of these issues seem kind of quaint to most modern Christians, yet at the time they happened they where intensely argued, and people of genuinely different opinions fought both sides. I submit that Christ's Church has not only withstood these changes, but has flourished.